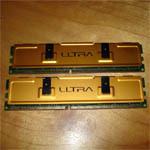 Ultra sent over one of their 1024MB kits of their DDR XL memory for us to check out. With the claim of &#34;Extreme Low Latency No Matter What!!&#34;. A bold claim that we will definitely test to see if these DDR XL memory modules are up to the challenge. Ultra rates the XL series at 2-2-2-5 @ 400MHz Front Side Bus speed. The XL memory is also has a nice look with the Gold heat spreaders to help control the modules temperature.